You'll find this Kit Bag to be truly utilitarian and incredibly versatile. There are unlimited uses for the Kit Bag from a medical kit to a tool kit. The Kit Bag can be used to stow essential medical supplies, tools in your car, or be there for you when you are traveling around the country. 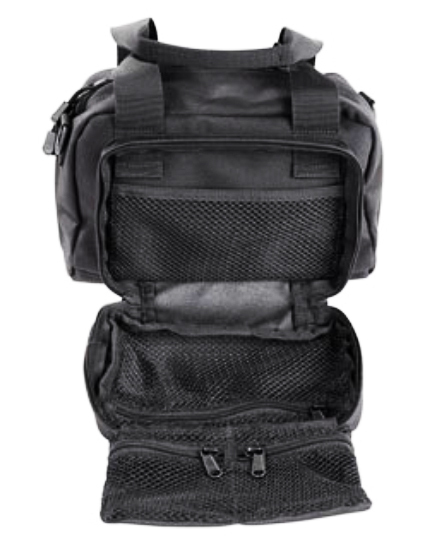 It features a fold out organizer panel with multiple zippered mesh pockets, YKK® zippers and padded shoulder strap. The main compartment is 5 ½ x 5 ½ x 9. The third compartment on the back of the Kit Bag will handle the last of your gear or provide instant access to critical trauma supplies. Made from 1050D nylon, this Kit Bag will endure the harshest environments and be there for you when you need it. You can count on 5.11 Tactical Series to bring you innovation and modern construction materials, to combine them for functional use, and to adjust them to the traditional needs of Law Enforcement, Fire Fighting and EMS. Measurements L 5 1/2" x W 9 1/2" x H 9 1/2"